In today’s litigious business world, cyber-related matters could land you in court. As a computer security professional, you are protecting your data, but are you protecting your company? While you know industry standards and regulations, you may not be a legal expert. 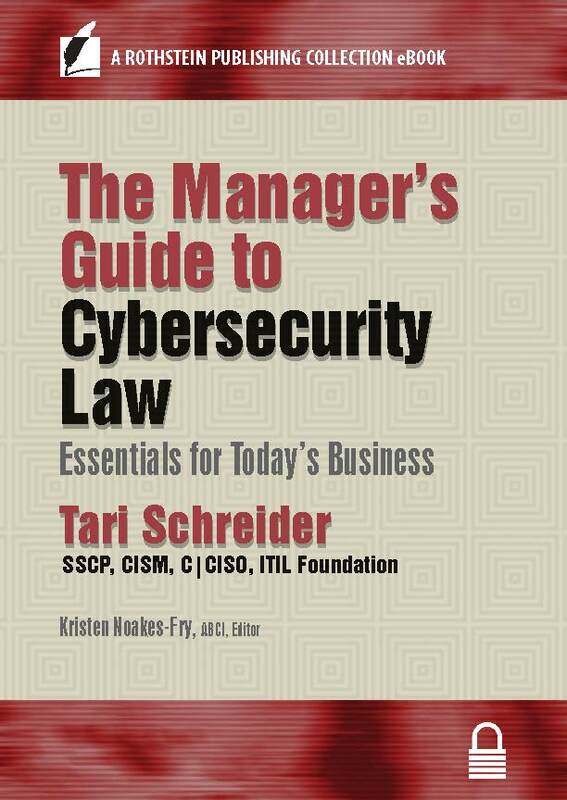 Fortunately, in a few hours of reading, rather than months of classroom study, Tari Schreider’s The Manager’s Guide to Cybersecurity Law: Essentials for Today’s Business, lets you integrate legal issues into your security program. Understand your legal duty to act reasonably and responsibly to protect assets and information. Identify which cybersecurity laws have the potential to impact your cybersecurity program. Upgrade cybersecurity policies to comply with state, federal, and regulatory statutes. Communicate effectively about cybersecurity law with corporate legal department and counsel. Understand the implications of emerging legislation for your cybersecurity program. Know how to avoid losing a cybersecurity court case on procedure – and develop strategies to handle a dispute out of court. Develop an international view of cybersecurity and data privacy – and international legal frameworks. Schreider takes you beyond security standards and regulatory controls to ensure that your current or future cybersecurity program complies with all laws and legal jurisdictions. Hundreds of citations and references allow you to dig deeper as you explore specific topics relevant to your organization or your studies. This book needs to be required reading before your next discussion with your corporate legal department.